Turn on ITV at 9pm and you’ll most likely be greeted by the latest period drama boasting stately homes, acres upon acres of gardens and the richest Brits around. Back then the only way to make an exhibition of your wealth was by owning the biggest, tallest house on the manor. Drawing rooms, libraries and sweeping staircases have always been as much a tangible representation of wealth as champagne and lobster dinners. Well, not anymore. Whether it be a penthouse overlooking the capital or a cosmic first floor apartment with high ceilings and more bedrooms than you can shake a stick at, the rich are choosing to snap up opulent, trophy properties, without a single stair in sight. And this new penchant for single level properties is reflected in their price – James Forbes of Knight Frank Knightsbridge explains that more often than not, these super flats cost almost double the amount per square foot of previously sought after fine Georgian terraces. ‘A house in Belgravia with six floors and no lift might fetch between £2,000 and £2,400 per square foot, whereas the equivalent figure for an apartment would be closer to £4,000’. 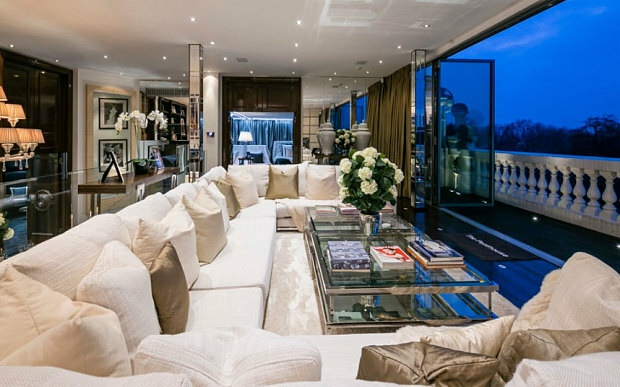 The most expensive home sold in Britain this year, in fact, was a purpose built penthouse in Mayfair which went for a cool £7000 per square foot. Many of these homes are ‘more like five-star hotels in character than traditional London houses’ says estate agent Peter Wetherell. It’s no wonder Celebrities, stock-brokers, Arab princes and Asian bankers alike are falling over themselves to own lateral living space in the heart of London. So why the sudden shift in residential preference? Gone are the days of ‘Upstairs, Downstairs’, where staff were kept physically separate from their upper-class masters. Now it’s perfectly acceptable to have a live-in maid as your best friend and a personal trainer who doubles as a stylist. This swing in social norms has made apartments all the more appealing. Moreover, the emphasis of luxurious home living has shifted from dinner parties and retiring to the drawing room to complete and utter relaxation. Buyers no longer seek a home for entertaining guests – instead they want to sweat it out in their home gym before sprawling out on their three piece sofa in front of a home cinema, complete with surround sound (of course). Next up – foreign investment. As always, this plays a big part in the British property market. International buyers want fully fledged, furnished, spectacular apartments – and they won’t settle for anything less that knockout. It follows that they are choosing penthouse apartments then, as these new-builds are the most sought-after, well presented properties available on the market. (We’re talking ‘you’d be forgiven for thinking you’d walked onto a movie set’ kind of fabulous. “International buyers in particular want turnkey properties, so our most coveted homes are either newly built or refurbished to a very high standard,” says Becky Fatemi, managing director of Rokstone. You only have to take a look at Zoopla property site to see there’s no shortage of newly built luxury flats and penthouses available in the capital – with a sizeable price tag to match their epic proportions. This 3 bed penthouse apartment located in the heart of Mayfair (pictured below) boasts a private roof terrace, dedicated concierge service and discrete security presence in the entrance lobby to assist owners and greet guests, but this level of luxury doesn’t come cheap. 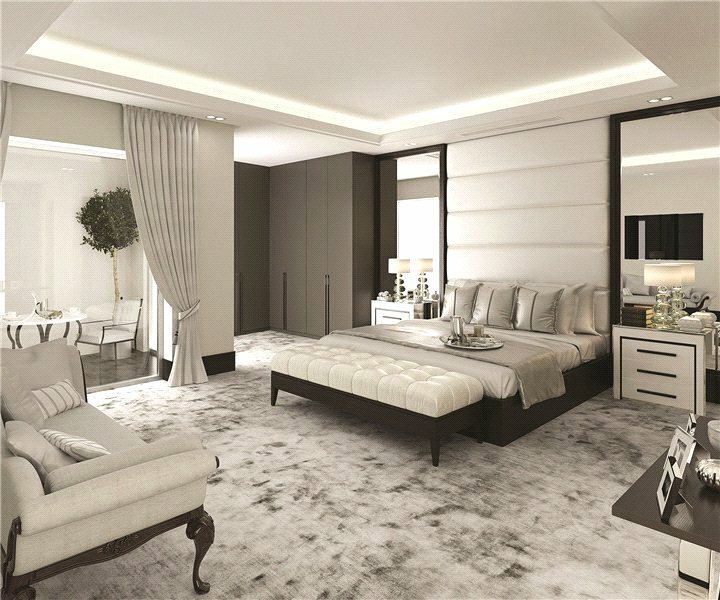 For any apartment of this calibre there’s a price to pay – £9,250,000 to be exact. Described as ‘contemporary living in a historic setting’, this duplex apartment epitomises luxury. If you want to live in central London, and you want a new-build, an apartment is the only option available; there just isn’t the physical space to build two storey houses. And this new wave of lateral thinking is re-shaping the whole of London’s property market.